The London 2012 Olympic and Paralympic Games presented Transport for London (TfL) with one of its biggest ever challenges: to operate a road traffic system that would facilitate not only the smooth-running of the event but also the efficient flow of non-event traffic. TfL required the temporary deployment of an extensive network of mobile variable message signs (VMS) to support the Olympic Route Network (ORN), providing clear and quickly perceptible route instructions to road users. In what was believed to be the largest single deployment of solar powered mobile VMS in the world, TfL appointed MVIS to supply, install and support 177 signs. Prior to the event, MVIS trained over 80 TfL traffic control centre traffic coordinators to use the VMS system, helping it to assign the signs to groups. 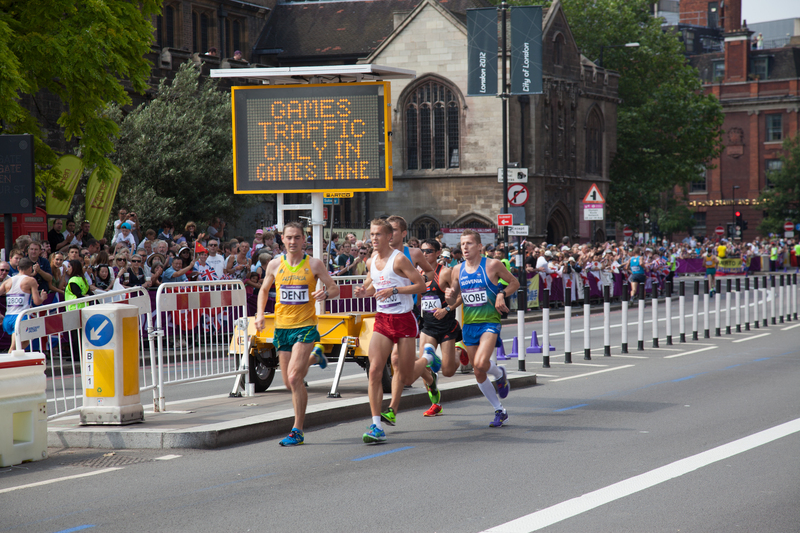 MVIS’ Web Studio™ sign management system then allowed TfL to send messages to the groups of signs on different parts of the ORN in a single transmission, enabling it to dynamically and efficiently control access to the Games Lanes. The messages were displayed, enabling road users to quickly identify whether or not they were allowed to drive in the Games Lanes. By using different colours, user message interpretation was speeded up significantly. Current DfT regulations meant that only white and amber messages were permissible, and feedback suggests that using red and green would have been even more impactful. Throughout the event, MVIS’ team provided ongoing back office guidance to TfL’s traffic control centre traffic coordinators. It also supplied logistical support with moving the highly portable signs, often at short notice.